This document provides information regarding options for "Rounding" and "Default Score". 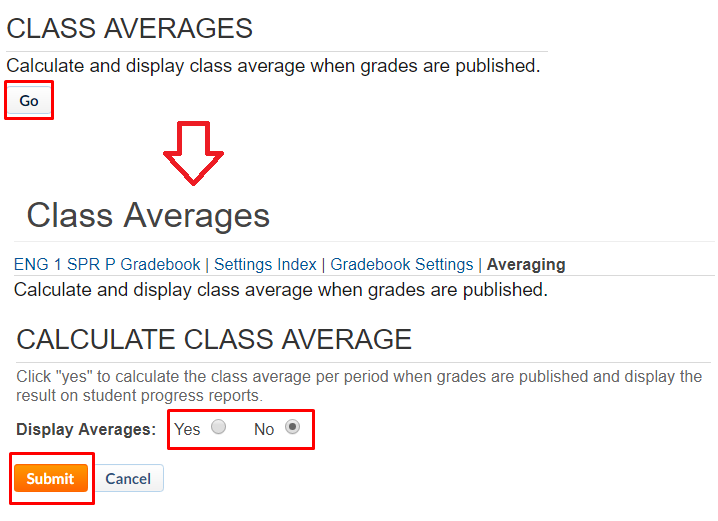 You will only see "Class Average" if an administrator has enabled this feature. The Rounding option allows teachers to change how many decimal places will be displayed for overall grades. This number can be set to either 0, 1, or 2 using the drop-down menu. If zero is selected, the Gradebook will round to the nearest whole number. For example, if a student's overall grade is 93.667%, the Gradebook will round this score to 94%. Note that this setting only affects the student's overall grade, not individual grades entered for assignments. Even if your rounding is set to 0 decimal places, you can still give a student fractional points on any assignment and the Gradebook will not round this score. This allows for a more precise rounding of the overall grade. By default, new assignments in your Gradebook will not have any value entered as a score, just empty cells. The Default Score option allows teachers to have all students start new assignments with a score of zero points instead. If the Default Score is set to "0 (Zero)," the zero will immediately count towards the student's overall score in your Gradebook. For this reason, most teachers choose to stick with the default setting of "Empty". Note: Because a 0 (zero) is technically a counted value in the Gradebook, you cannot use autofill to overwrite cells with a zero in them. If you use autofill prominently, you will probably want to leave this option set to "Empty." A school administrator must enable this feature School Settings before it becomes available to teachers. This feature gives you the option to include the overall class average in the progress reports for individual students, allowing students and their parents to compare the student's average with the average of all students in that period.